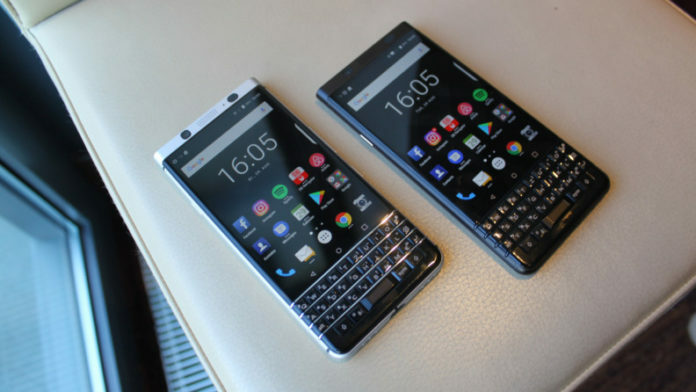 The BlackBerry KEY2 is an answer to all the complaints that were levelled against the first-generation KEYone. Fortunately, this manages to answer almost all the issues. However there is a lot more to focus on all the subtle as well as uniformly applied improvements that have been made has left all the other aspects of the phone also affected. This draws us to a conclusion that the comparison between BlackBerry KEY2 and BlackBerry KEYone needs to be drawn. Here we will let you think about Which is better BlackBerry KEY2 or BlackBerry KEYone? The KEY2 offers you 4.5-inch 1620×1080 pixel IPS display exactly similar to KEYone. Neither the capacitive buttons nor the implementation of capacitive buttons has changed. Doing so has somehow put a limit to the upgradeability of KEY2. The easy grip of the phone is still intact with the textured back. Also, both have sport headphone jacks in addition to the single downward-facing speakers. Both offer micro SD up to 2TB Expandable storage. Front Camera of both is 8MP Selfie flash 1080p/30 video and video is 4K @ 30fps, 1080p @ 60fps HDR. In addition to this, the two have 3500 mAh Non-removable battery and Quick Charge 3.0 USB-C charging. Both tend to lack water resistance but offers Wi-Fi 802.11 ac, 5GHz, Bluetooth 5 + LE, NFC GPS, GLONASS connectivity and Front-facing fingerprint sensor (in keyboard) DTEK security suite FIPS 140-2 Full Disk Encryption Android For Work, Google Play for Work security. Right from the size of the keys on the eponymous keyboard up till the specs there are loads of difference too. To begin, while the Operating System of KEY2 is Android 8.1 Oreo, it is Android 7.1 Nougat for KEYone. On one hand Key2 has Qualcomm Snapdragon 660 4x Kryo 2.2GHz, 4x Kryo 1.8GHz Adreno 512 GPU Processor while key one has Qualcomm Snapdragon 625 Octa-core 2GHz Adreno 506 GPU. Key 2 has 6GB RAM and 64GB / 128GB Storage while key one has3GB RAM and 32GB Storage. Rear Camera 1 and 2 of former is 12MP (1.3 micron) ƒ/1.8 laser+phase auto focus dual-tone LED flash and 12MP (1 micron) ƒ/2.6 2x optical zoom portrait mode respectively while of latter is 12MP (1.55 micron) ƒ/2 phase autofocus dual-tone LED flash and n/a respectively. All in all, we expect that you have got the answer for Which is better BlackBerry KEY2 or BlackBerry KEYone? The KEY2 costs $649 USD and $829 CAD. It is said that it will release in Canada on July 6 and in U.S. on July 13. It costs $100 more than the KEY one but offers value too. Make a choice for yourself based on your preferences and desires.